Way back in 1992, I heard that Nigel Kennedy was visiting West Cork.The word was that he was a bit of a character so I got this mad notion that he might be in to doing a gig in our bar. Obviously we couldn't afford to book him and he wasn't exactly a regular on the West Cork pub scene so I decided that we would have to somehow make the idea more attractive to him and hence the Fiddle Fair was born. We're still waiting on Nigel but in the meantime the Fiddle Fair has grown and today is recognised as being one of the very best traditional and folk music festivals in the world. 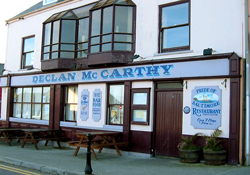 For the first few years it consisted of two weekends of music in McCarthy's featuring mainly local musicians with the odd one thrown in from up the country. The very first Fiddle Fair line-up included Nomos, Any Old Time, Seamus Creagh, Dordan, Ritchie Tisdall and Steve Wickham. I remember a great night when Steve played and members of the audience joined him on stage to sing songs and afterwards everyone headed to Sherkin for some serious late-night frolicking. Over the next few years it evolved to become nine nights of music and gradually gained a reputation amongst musicians as being a great festival at which to play. Some of the biggest names in Irish music performed on that tiny stage including Altan, Paul Brady, Sharon Shannon, Patrick Street, Lúnasa, 4 Men and A Dog, Frankie Gavin, Tommy Peoples, Sean Maguire and many more. As the years went by we also hosted many international acts including Liz Carroll, Dirk Powell, Dezi Donnelly & Mike Mcgoldrick, Kevin Burke, Tim O'Brien and The Foghorn String Band. So many extraordinary nights! I remember the whole house jumping for the Dirk Powell Band, a stunning sunset which gave the Nollaig Casey and Arty McGlynn gig a special magic, the sheer spectacle that was the late Sean Maguire’s gig, the array of headline acts that were in Tim O’Brien’s 'Crossing' show, an electric gig by the Hendrix of Irish fiddler’s Cathal Hayden with Gerry O’Connor & Kevin Docherty, and Dermot McLaughlin’s and Kevin Burke’s solo gigs. 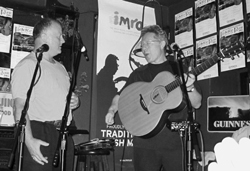 I had the pleasure to work for Altan for a while and have seen them play many times but I don't think I've ever seen them better than their gig at Fiddle Fair '03, a truly memorable night made even more special by our 'support act' that evening, Christy Moore! I'm sure the hundred or so people at that gig will never forget hearing Christy and Paul Brady sing The Lakes of Ponchatrain together. As well as the great music, The Fiddle Fair has always been great fun. I have a feeling that this may have something to do with the record amounts of alcohol consumed. I remember one year, '02 perhaps, that we had 4 consecutive nights where someone 'crashed' their car going home - nothing major thankfully. Liam Cotter had a part to play in one of them and Liam is possibly the only person who has been to every single Fiddle Fair show. Looking back now, I think we have accomplished that aim although we're still waiting on presenting a fiddler from Baltimore. After selling the bar in 2004 our festival needed a new home and for the next three years we found one at the Baltimore Harbour Hotel. In 2006 we transitioned to our current 4-day format and held our first shows at the stunning venues Dún na Séad Castle and Glebe Gardens Amphitheatre and also introduced our session and workshop strands around the village. Then in 2007 we had our last year there as sadly the hotel closed down. We had some magic nights there with the likes of Bruce Molsky and Crooked Still from USA, Fiddlers' Bid from Shetland, Buille, Siobhan Peoples & Michelle O'Brien and a young Mick Flannery from Ireland and a very special night with the only African band to appear at our festival; Malian blues sensations Afel Bocoum and Alkibar. There was also a very special concert where we inducted the only member of the Fiddle Fair Hall of Fame, the legendary Arty McGlynn. I remember getting a call at 8am one Monday morning from Mary Flaherty at reception to come down and clear some bodies from the dining room as guests were coming down for breakfast – Happy Memories indeed! The closure however presented us with another quandary and for 2008 we transferred the night time concerts up river to the West Cork Hotel in Skibbereen. Despite initial misgivings this proved to be an excellent edition and in terms of ticket sales was actually our most successful so far. The line-up included a very special visit by legendary Cape Breton fiddler Jerry Holland with John Doyle. It also featured the culmination of local actor Jeremy Irons' journey where he was taught the fiddle by Caoimhín Ó Raghallaigh for a TG4 programme and he performed a concert at Glebe Gardens along with Caoimhín, Brendan Begley and Martin Hayes & Dennis Cahill. We now had Oscar winners as well as Grammy winners on our roll of honour! In 2009 we bit the bullet and introduced the Fiddle Fair Marquee. This enabled us to move back to Baltimore and there we have remained. Often chilly, always airy and occasionally hot and sweaty, it always provides a cracking atmosphere. Beginning with Sean Keane and Liam O'Flynn on a freezing night in 2009 and finishing with Pennou Skoulm on a balmy night in 2018, it has hosted some truly exceptional concerts with artists from all over the world. From Väsen to Aly and Phil, John Sheahan to Casey Driessen, Eddi Reader to Ling Peng and The Foghorn's to The Teetotallers, it has seen some magical gigs and never an ounce of trouble. There have been some incredible concerts and some surreal ones, none more so than The New Rope String Band in 2014 where the audience were 'treated' to the sight of an accordion-wielding gentleman wearing nothing but pink underpants.The loudest shows have been our annual Friday morning concerts for local primary schools where thousands of very discerning children have been introduced to world-class music at close quarters, although one of them told me that the best thing about their annual trip was the free bar of chocolate. The past few years has seen the Fiddle Fair grow a little in size and a lot in stature and we continue to attract audiences from all over the world to this little corner of west Cork. It is particularly gratifying to see the ever-increasing number of visitors who now make an annual pilgrimage to our festival, some of whom have written their own reflections in our 25th anniversary booklet. Its great to hear all the accents and languages come together for 4 or 5 days every May, all sharing a love of great music. Our buddy Tim O'Brien once told me that 'bigger isn't necessarily better' and we have tried to follow that maxim. Like traditional music itself it is vital to keep evolving to avoid stagnation so as we reach this milestone of 25 years we wonder what the future will hold and what the next steps should be. Do we call it quits and go out on a high? Or move to another home that can accommodate greater numbers? Or maybe change the format slightly by introducing simultaneous concerts around Baltimore? All food for thought as we enter our second quarter century but rest assured that with your support we will continue to try and present one of the best traditional and folk music festivals on the planet and hopefully Nigel will be along soon.